In the run-up to the G20 summit in Germany’s Hamburg on July 7-8, prospects for the first personal meeting between Russian President Vladimir Putin and his US counterpart Donald Trump are becoming more uncertain, Kommersant business daily writes on Monday. Amid the lack of official confirmation that the meeting will be held, the sides have scaled back contacts on its preparation after the Senate passed a bill, which slapped new sanctions on Russia. Russia’s detractors in the US Congress are working overtime to throw a monkey wrench into the bilateral agenda, and among other things are calling for a withdrawal from the Intermediate-Range Nuclear Forces Treaty (INF Treaty). This mounting pressure is pushing Trump to toe the line of his opponents, thereby rolling back any opportunities to normalize ties with Moscow and driving it to opt for a tough response, the paper says. The latest statements by officials in Washington and Moscow show that both parties might prefer to keep a tight lid on any information about the two presidents’ imminent meeting in Hamburg until the very last moment. "Trump’s huge problem is the United States Congress, which tries to stonewall any attempt to better relations with the Kremlin. The Senate’s decision to tighten sanctions is in fact a signal to the White House that the administration will be under a watchful eye in the run-up to the G20 meeting and that even non-public agreements between the US and Russian presidents won’t mean a lot without Capitol Hill’s go-ahead. The legislative branch seeks the right to oversee the president’s foreign policy and this comes for the first time in the US history," American University History Professor Anton Fedyashin told the paper. "The meeting between Vladimir Putin and Donald Trump will be held, but behind the closed doors and without a lot of fuss, taking into consideration the allegations by American legislators against the US president," Fedyashin noted. Washington is demanding that the United Nations include the regional branches of Al Qaeda and the Islamic State (both outlawed in Russia) in its list of terrorist organizations, high-ranking Russian diplomatic sources told Izvestia. Experts say if this proposal is backed, Washington will get the green light under US legislation to launch special operations in third countries. So, by expanding the list of terrorist organizations, the US plans to legalize its interference in the affairs of other states, the paper says. 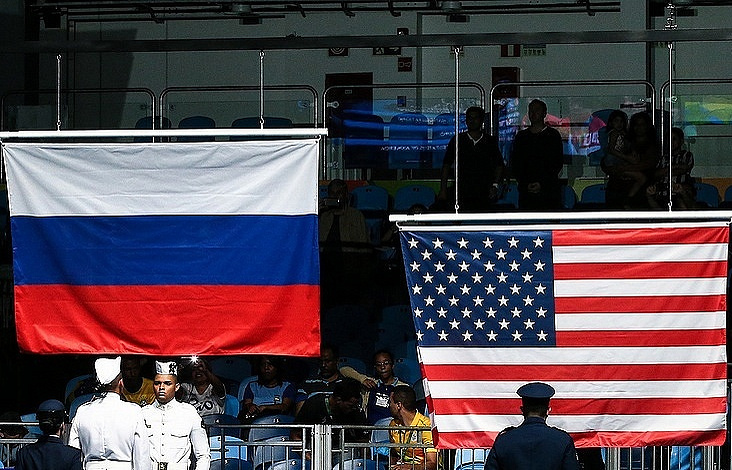 Russia and a number of other countries, in particular, Egypt, have come out against Washington’s proposal, fearing US attempts to meddle in their domestic affairs, the diplomatic sources told the paper. "Egypt, which is fighting against Al Qaeda on the Sinai Peninsula, roundly opposes the idea. Cairo believes that the inclusion of Al Qaeda’s regional branch in the international list will signal the inability of the country’s authorities to cope with this threat alone," one of the sources said.In Russia, where terrorist groups affiliated with Al Qaeda or IS are inconsiderable in number, the authorities may deal with them independently without any external help, the source noted. The problem of classifying organizations carrying out armed conflict is a challenging one, seeing that recently the new UN Counter Terrorism Office was established, the paper points out. It is still unclear how the countries will come to terms on which structures should be recognized as terrorists. 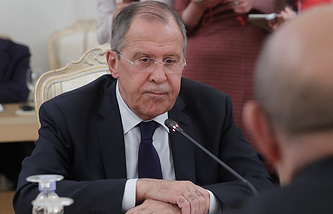 Russian military analyst Anton Lavrov said the US wants to broaden the UN list of terrorist organizations not because of any goodwill, but because it seeks to legalize the possibility of meddling in other countries’ affairs, putting it in line with US legislation. "Formally, the Pentagon does not have the right to covertly act on the territory of third countries without declaring war. But back in 2001, attorneys for the US Defense Department came up with a loophole on how to bypass this prohibition. That’s why now separate special units may carry out ‘black’ operations in countries where terrorist organizations are based. But thanks to a recent mishap, it became known that the Pentagon compiled the lists of such organizations independently without any coordination and conducted operations against them. That’s why now special units controlled by the department have the right to work only against those terrorist organizations which are recognized by the UN," he explained. This particularly refers to the new Joint Special Operation Command, which consists of an elite special task force, reconnaissance units and even a fleet of combat drones, he said. The task of the JSOC is to track down and eliminate persons and organizations around the world that threaten US interests. The US command and the Pentagon never reveal their moves to the leadership of countries where such operations are conducted, the paper says. The peacekeeping operation in Syria, involving Russia, Turkey and Iran, is facing more hurdles. Moscow’s closest allies in the Post-Soviet security bloc, the Collective Security Treaty Organization (CSTO), Kyrgyzstan and Kazakhstan, refuse to join the effort, Nezavisimaya Gazeta writes. Last week, Vladimir Shamanov, who heads the State Duma (lower house) Defense Committee, said that Moscow was in talks with Bishkek and Astana on deploying the countries’ troops to Syria. However, Kyrgyz President Almazbek Atambayev and Kazakhstan’s Foreign Minister Kairat Abdrakhmanov refuted the statement. However, sources told the paper that certain consultations on sending Kyrgyz and Kazakh forces to Syria have been recently held, not ruling out that they are still on the table. Kyrgyzstan’s Foreign Minister Erlan Abdyldaev said such consultations had been held "within the framework of the CSTO upon the initiative of the Russian side, but the idea did not go any further." Military expert Yury Netkachev pointed out that officially Russia has called on its partners to take part in mine clearance efforts and the delivery of humanitarian cargos in Syria several times. "It is not very clear why Russian proposals are being averted," the expert said. 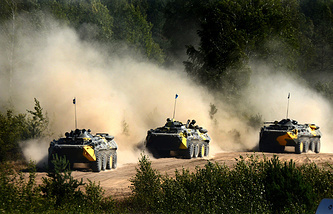 Russia cannot demand that its CSTO allies increase military spending, Netkachev said. "Apparently, our allies don’t have the understanding and solidarity on taking part in ensuring security in regions where terrorists are active. Among members of the Islamic State (terrorist group, outlawed in Russia) in Syria there are many natives of Kazakhstan and Kyrgyzstan. Why don’t these countries bring order there together with Russia?" the expert said. "Apparently, everything depends on money and geopolitical guidelines, which the so-called allies of Russia have defined for themselves," he explained. The expert recalled that Kazakhstan’s troops eagerly participated in the US and NATO operations in Afghanistan. Kyrgyzstan allowed the US to open its military base in its country some time ago. "This ran counter to Russia’s interests," Netkachev highlighted. Official forecasts that the ruble will weaken have become a reality. Against the backdrop of new sanctions and plunging oil prices, the Russian currency fell 4% to 59.4 rubles to the dollar late on Friday. However, most Russian companies, including exporters, benefit from a strong ruble, a report of Russia’s Central Bank showed, according to Vedomosti. The regulator assessed that industries focused on intermediate, including external demand, namely manufactures of timber, rubber and plastic, generally suffer from a strengthening ruble. They export more than they spend on the imported raw materials. Yet, producers of chemicals, foodstuffs and electrical equipment will maintain their profitability if the ruble is strong, the Central Bank said. The profitability of textile industry and car manufacturers will even grow. 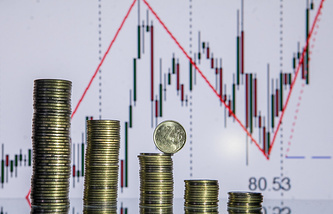 Surveys conducted by the Economic Policy Institute show that most enterprises need a strong ruble. The majority of processing enterprises want the ruble to strengthen, said Georgy Ostapkovich, Chairman of the Higher School of Economics Center for Market Studies. The strongest ruble - 42 rubles per dollar - is in high demand among the producers of pharmaceuticals, who mostly depend on imported goods and equipment, said Sergey Tsukhlo, who leads the laboratory of market surveys at the Economic Policy Institute. According to the Institute, the food industry needs a national currency rate of 48-49 rubles to the dollar. A spokesman for Miratorg (a Russian agricultural holding) disagrees with this assessment, saying that even the current ruble rate is based on speculative capital and an adequate one would be around 65-70 rubles to the dollar. The company has been carrying out an active policy of import substitution, fostering the production of certain elements in Russia. After deep discussions, the Kremlin political bloc decided that the major pillars of the 2018 presidential campaign should be justice, respect and trust. 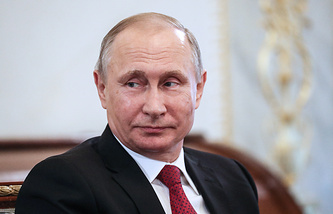 Although Vladimir Putin has not yet announced his participation in the election, all plans are focused on him, a source close to the presidential administration and a federal official told RBC. These three key objectives have been chosen because Russian society wants the leadership to address domestic problems, a source close to the Kremlin said. Putin used these three words during his state of the nation address on December 1, 2016, the paper writes. The top five pressing issues that concern Russians now are low salaries, the gap between the rich and the poor, rising costs and the deteriorating quality of medical services, as well as the lack of high-paying jobs, Director General of the Russian Public Opinion Research Center Valery Fedorov told the paper. "Possibly, the Kremlin plans to refine Putin’s image. It has been always focused on strength and decisiveness rather than commitments to ideals of humanism. Meanwhile, the demand for them is mounting," political scientist Abbas Gallyamov said. People are tired of aggression and conflicts, they want calm and consolidation, and Putin should now search for a compromise and unite the public, he said. "If this is put in terms of archetypes, a chieftain should be replaced by a wise elder. This is pushed by Putin’s age (64 years) and the changing demands of the public," he said. The campaign’s message may be devoted not to ‘fighting enemies’, but rather to the need to consolidate and build a more just society - "we have raised the country from its knees" and now it is time to start developing it, Gallyamov said.